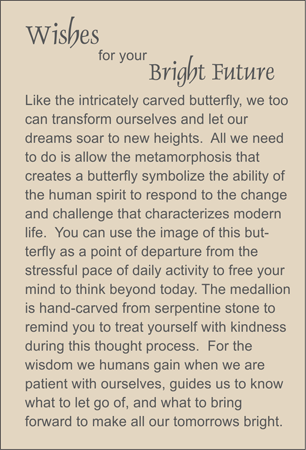 Blue-colored serpentine hand carved medallion showing butterfly as a symbol for metamorphosis. Accented with goldstone, ancient Chinese coin replica , black agate, and black tassel. These BOOKjewels look great when tied onto lamp switched and finials. HOW TO USE: To use, place the coin at the base of the book, iPad or tablet. Insert the double black cords through the pages and drape the medallion over the top.